Spirit is one of the two Mars rovers that NASA launched in 2003 as part of the agency's $800 million Mars Exploration Rover (MER) mission. Spirit arrived at the Red Planet in January 2004, tasked with figuring out if life ever existed on Mars, learning about the Red Planet's current and past climate, and characterizing Martian geology. Spirit's explorations provided scientists a remarkable glimpse into Mars' early and wet history. Very soon after its landing, Spirit found extensive evidence of carbonate and hematite, minerals that are associated with water environments. The rover overcame numerous technical difficulties (including a faulty wheel) and delivered scientific data back to Earth for six years. But there was one obstacle Spirit couldn't overcome: an unexpected sand trap. NASA spent weeks trying to help the robot get to safer ground but made little headway. Trapped, the rover eventually stopped transmitting information back to Earth on March 22, 2010. The rover left behind a trove of scientific information about Mars' history. It also paved the way for a more robust rover to follow: Curiosity, a rover focused on looking for habitable environments on the Red Planet. Curiosity is the pathfinder for the new Mars 2020 rover, which is expected to search for signs of ancient life. Spirit is one of a suite of spacecraft in NASA's second wave of Mars exploration. The agency sent several missions to Mars in the 1960s and 1970s but paused after the Viking 1 and Viking 2 landers did not bring back definitive evidence of current or past life. According to the agency, interest in Mars was rekindled in the 1980s and 1990sas researchers on Earth uncovered microbes not only surviving, but also thriving, in the extreme environments of underwater volcanic vents. This discovery was exciting because Viking pictures showed possible evidence that the area had water in the past. NASA sent the Mars Global Surveyor (MGS) to the planet in 1996 to map out possible water sites, and the agency also sent the Mars Pathfinder and Sojourner rover mission to the Martian surface in 1997 with great scientific success, as it found round rocks that were likely shaped by water in the ancient past. The finding sparked interest for more Mars rovers, and in January 2004, NASA launched Spirit and Opportunity. More formally known as the Mars Exploration Rovers, the machines received their names from 9-year-old Sofi Collis, who was the winner of a naming contest. Spirit and Opportunity carried a large collection of scientific equipment. The instruments on each rover included a panoramic camera, a microscopic imager, engineering cameras, three spectrometers, a rock abrasion tool and a magnet array. The rovers also had a small arm that allowed them to obtain close-up pictures and data about interesting scientific targets. It took two years of negotiating for scientists and engineers to agree on landing sites for Opportunity and Spirit. "The places most appealing to scientists (the side of a cliff, for example, on which the planet's history is recorded in layers of sedimentary rock) are often the most frightening to engineers charged with the robot's safety," NASA wrote of the process. Opportunity targeted a plain called Meridiani Planum based on a layer of hematite that MGS spotted from above. Hematite is an iron oxide that often forms in water. And, as it turned out, Opportunity found lots of hematite on the surface. Spirit's destination was Gusev Crater, which spans an area bigger than Connecticut. From MGS pictures, scientists suspected the crater held water in the ancient past. Gusev was dug out by an asteroid or comet that impacted the planet as early as 4 billion years ago. Spirit was the first of the two rovers to leave Earth. It blasted off on a Delta II 7925 rocket from Cape Canaveral, Florida, on June 10, 2003, and made its final descent to Mars seven months later, on Jan. 4, 2004. After snapping open a parachute, the rover careened to the surface in a cocoon of airbags, rolling safely to a stop on the surface — right on target in Gusev. Opportunity also landed safely and at the right spot, on Jan. 25. Spirit was still sitting in its landing shell when it spotted the first possible sign of water in the distance: carbonate, which often forms in wet environments. "We came looking for carbonates," Phil Christensen, one of the scientists for the mission, said in a statement. "We have them. We're going to chase them." But within a week, Spirit was in trouble. It temporarily stopped sending data from the surface on Jan. 21, 2004. Days later, NASA determined that the rover's computer was perpetually rebooting due to a software error; it restarted more than 60 times in three days. The agency stabilized the rover in February 2004. Then, in March, Spirit hit a jackpot: a volcanic rock whose composition hinted at a watery past. Three months later, NASA was surprised when Spirit stumbled across hematite, adding evidence to the possibility of water in the environment. Opportunity also found hematite at its landing site halfway across Mars. By late 2005, Spirit had driven up a nearby landmark, Husband Hill, to take a look at the landscape around it. It was the first time a rover had climbed a hill on another planet. The area was a testament to Mars' early violent history, NASA said. "We've got this dramatic topography covered with sand and loose boulders; then, every so often, a little window into the bedrock underneath," Steve Squyres, a planetary scientist at Cornell University and the principal investigator for the rover's science instruments, said in a statement. One of Spirit's wheels quit working in March 2006 as the rover was racing to a slope to get enough sunlight to last the winter. NASA operators back on Earth remotely dragged the wheel behind the rover, slowly moving Spirit an hour a day as the sun's strength allowed. Spirit safely arrived at its destination in April 2006. The location proved to be a good spot to stop, as the rover found water-altered minerals nearby when it resumed operations in late 2006. Despite mechanical and Martian challenges, Spirit journeyed 4.8 miles (7.7 kilometers) during its years on Mars — more than a dozen times the distance that NASA planned for the rover to travel. 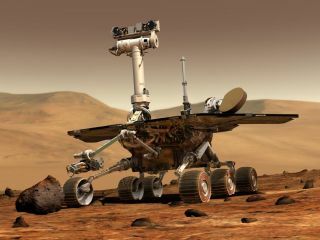 In fact, the malfunctioning wheel ended up being useful to the mission: In March 2007, NASA announced that the rover had churned up soil with sulfur and water traces in it, suggesting that there could be evaporated springs or volcanic vents. As the year passed, Spirit uncovered the site of a possible volcanic outburst and survived an extensive dust storm. Another storm in late 2008 reduced Spirit's power to concerning levels, but the rover pulled through. Martian winds cleared some of the dust in February 2009. In April, Spirit's computer began to have rebooting trouble again, with periods of what NASA described as "amnesia." The rover began driving again as NASA worked to fix the problem but then ran into an even worse problem: sinking sand. On April 23, 2009, the rover unexpectedly broke through a crust into softer sand and couldn't get out again. NASA spent months running simulations and sending commands to the stranded rover, but the agency also collected data while the rover was standing in place. NASA officials were delighted to see sand with basalt, sulfate and silica in it — data revealed to the rover as it tried to get out of its trap. One NASA statement called the location, called Troy, "one of the most interesting places Spirit has been." On Dec. 31, 2009, NASA calculated that there might not be enough power for the rover to last the winter. Spirit's last communication came on March 22, 2010, and the rover remained silent as NASA spent months hailing it. "Engineers' assessments in recent months have shown a very low probability for recovering communications with Spirit," NASA officialssaid in a statement on May 24, 2011. In any case, the space assets being used to look for Spirit would soon be needed for NASA's upcoming Mars rover, Curiosity. That month, NASA concluded its efforts to reach Spirit. While Spirit stopped communications with Earth in 2010, its twin rover, Opportunity, went far beyond that. Opportunity continued operating well into 2018 — roughly 14.5 years after its landing date — but was stalled on the surface due to a dust storm in June 2018. As of fall 2018, Opportunity hasn't been heard from since June. No matter Opportunity's fate, the rover and its twin, Spirit, still lie large in NASA lore. Both rovers showed the world how good engineering and science can uncover incredible and valuable information, such as the extensive evidence of water on the Red Planet. NASA's experience with rovers came in handy with the newer Curiosity rover, which arrived on the surface of Mars in 2012 and has been studying the history of habitable environments and water in Gale Crater and Mount Sharp (Aeolis Mons). Operators use Spirit's and Opportunity's scientific work to inform Curiosity's traverses. For example, Curiosity can sense when it is in a sandy zone and is programmed to stop and ask its operators on Earth for help. NASA's Mars 2020 rover will search for organics and other evidence of ancient life on the Martian surface. As of September 2018, one of the landing sites under consideration was Gusev Crater, where the Spirit rover met its demise. "The discovery that hot springs flowed here [Gusev Crater] was a major achievement of the Mars Exploration Rover, Spirit," NASA officials said when describing the potential landing sites. Spirit remains an important mission for NASA, because the rover showed the presence of water on Mars and helped lay the groundwork for future Mars missions.